Winning is something that is earned –– not given. Saturday afternoon in the shadows of Legion Field, the Owls learned how to put together a complete game of football as they beat UAB 37-23 behind the duo of quarterback Jaquez Johnson and running back Jonathan Wallace. After losing in admirable fashion late in games to Rice and Middle Tennessee State, FAU responded with a type of performance that warranted a win over UAB. Johnson accounted for 404 yards of total offense, while Wallace ran for a career-high 117 yards. Together the two helped FAU rack up 579 yards of offense –– which is the most for the Owls in the Carl Pelini era. Despite a kicking game that did almost everything in it’s power to derail the offense, Johnson and Wallace were able to grind the ball on the ground and keep the Blazers’ offense on the sidelines. Johnson tallied 105 yards with his legs–– which is the most ever rushing yards for a FAU quarterback in a game –– but more importantly he scampered 54-yards in the closing minutes of the contest to set up a 5-yard touchdown pass to William Dukes. The sophomore –– who played with a bruised shoulder –– showed no signs of injury. He opened the game a perfect 4-of-4 passing which allowed FAU to take an early lead on the road. 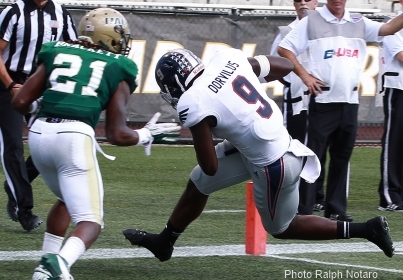 UAB countered with an offense full of fire power, but it simply didn’t phase the Owls. Trailing 10-3 late in the first quarter, Johnson engineered a seven play scoring drive that ended with a 3-yard touchdown run from the quarterback. Mitch Anderson’s blocked extra point gave the allusion that it was going to be one of those games for FAU, but Johnson and Wallace weren’t going to let it happen. Wallace scored on a 1-yard touchdown run, before a 15-play drive resulted in a 3-yard touchdown pass from Johnson to tight end Nexon Dorvilus (pictured) and gave FAU a 23-13 halftime lead. The Owl’s defense was doing it’s best to keep Blazers’ quarterback Austin Brown in check, but injuries to starting cornerbacks Keith Reaser and DJ Smith left the secondary ripe with youth. Brown connected with Jamari Staples for a touchdown to open the second half, and the FAU lead quickly vanished. Pelini called for what his offense did best, and that was move the ball between the tackles. Wallace raced 53 yards to the UAB 6-yard line which keyed a 1-yard touchdown run for Jay Warren to end the third quarter. With Anderson continuing to struggle in the kicking department, it was apparent that a seven point lead might not be enough and that’s when Johnson dashed 54-yards to put the game out of reach. The rushing tandem of Johnson and Wallace became the first pair of FAU players in program history to each run for 100 yards or more in the same game. FAU moves to 2-4 on the year, and picked it’s first ever Conference-USA win in the process. The hopes of making a bowl this season remain alive, as the schedule will only get easier after next week’s bout with Marshall. When FAU made a bowl back in 2008, they started the year 1-5.